After four straight games without conceding a single goal, Real Madrid couldn't get more than a 1-1 draw at the Mestalla, which has been enough to confirm the passage into the Copa del Rey semi-finals (1-3 on aggregate). Karim Benzema scored the opener for the Merengues, while Tino Costa equalized the encounter, right in the beginning of the 2nd half. Real Madrid completed the trilogy of games against Valencia within an 8 days period, after a 1-1 draw at the Mestalla stadium, that helped securing the ticket into the Copa del Rey semi-finals. Last week the Merengues had already won 2-0 at the Santiago Bernabéu, so they'll go through into the competition's next round with a 1-3 result on aggregate. The Spanish champions will now have to wait to know if their opponent will be either Barcelona or Malaga. 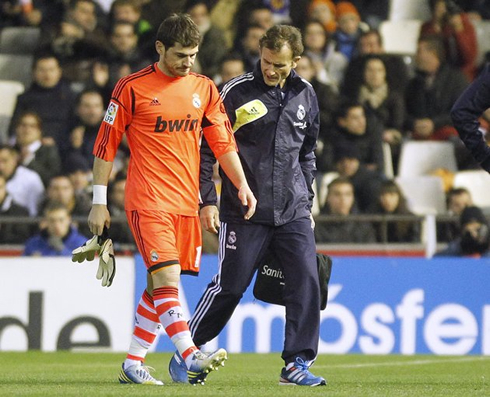 As for the game itself, Iker Casillas got injured early in the first half and had to be replaced for Adán, while Fábio Coentrão and Angel di María got shown the red card after the break. Karim Benzema's goal near half-time virtually sealed the deal for the Merengues, despite Valencia's small reaction in the the beginning of the second half, just after they started playing against 10-men and had reached the equalizer. Valencia knew the magnitude of the task they had ahead of them this Wednesday night, as Real Madrid travelled to the Mestalla with a 2 goal lead advantage, thanks to their victory at the Bernabéu last week. A single goal from José Mourinho's men would pretty much mean "end of the story" for the home side and that's what ended up happening, when Karim Benzema took his opportunity to get the opener, late in the first-half. With the scoreline at 0-0, both Valencia and Real Madrid knew that the round was still open for the two sides. A goal from "Los Che" would immediatly put the Merengues in check, while the opposite would virtually grant Mourinho's men the passage into the Copa del Rey semi-finals. With that in mind, Valencia chose to play a patient game, as they waited for the Merengues to make any mistake in order to capitalize on them. However, what actually happened was quite the contrary, as Ricardo Costa's misread a perfect and strong pass from Xabi Alonso, failing the interception and leaving Karim Benzema with enough space to control the ball and advance into Diego Alves' direction without further opposition. The French striker showed his usual coldness in front of goal, and with class, he struck the ball past Valencia's goalkeeper, to give Real Madrid the lead. Valencia and Real Madrid headed back to the locker rooms a few minutes after Benzema's goal, perfectly aware that only a calamity would be capable of switching the winner of this quarter-finals round. Nonetheless, "Los Che" didn't throw the towel and kicked off the second half putting pressure on Real Madrid. It paid off soon after the game had restarted, as João Pereira's cross hit Fábio Coentrão's arm, which forced the referee, Pérez Lasa, to show him his second yellow card of the night, and the corresponding red card. The Merengues clenched their teeth and responded by showing a good team spirit, which allowed them to hold on to the 1-1 draw right until the end and even despite another sending off close to the final whistle. This time it was Angel Di María who didn't resist to extend his leg in an attempt to hit João Pereira, but his timing couldn't have been worse as the referee spotted him with ease and immediately showed him a straight red card. This means that not only Fábio Coentrão will miss the first semi-finals clash, but also that the Argentinian winger won't be available in José Mourinho choices for the upcoming clashes in the Spanish Cup... Cristiano Ronaldo didn't manage to find the back of the net as he had done so easily last weekend and so the match ended with the 1-1 on the score line. Real Madrid will now wait for this Thursday's 2nd leg match between Malaga vs Barcelona, in order to know which team will face them on the Copa del Rey's semi-finals. 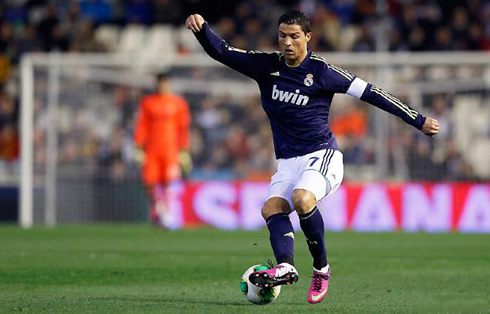 Cristiano Ronaldo next game for Real Madrid will be again Getafe, for the Spanish League "La Liga", on January 27, 2013. The game will take place at an unusual time, as it will be played at 12:00 (AM), local time. You can watch Juventus live stream, Real Madrid vs Getafe, Malaga vs Barcelona, Man Utd vs Fulham and Brighton vs Arsenal, all matches provided from our live football streaming section.